I know it seems pointless and almost hopeless these days - trying to leave the house looking presentable and maintain some semblance of order on your face throughout the day. Keeping the shine to a bare minimum and going about your daily activities without looking like an oil slick.....ugh. Trust me when I tell you that my oily skin is epic - I start producing oil even in the depths of winter. It's a miracle I haven't been tapped for an alternative energy source....ha, sorta. But in all honesty, I struggle so much with shiny skin and try everything, and I mean everything to keep it in check. So I decided to round up the products that are winning for me this summer, and share them so they may possibly win for you. 1. Laura Mercier Invisible Loose Powder - This stuff is absolutely amazing. I have no idea what they put in this powder that makes it so far superior to every other loose powder I have tried, but I am happy to enjoy the benefits. A dusting to finish off my makeup in the morning, truly can last me until late mid day without a need for touch ups. I find it even better when I take a powder puff or sponge and gentle press the powder into my face for an extra secure matte face - yes that is a thing. 2. Cover FX Blot Powder in Light - When I do touch up, I make sure this powder is near me at all times. It comes with a powder puff, but I actually love to use a small travel brush to dust it all over. It even works well over my lips before and after I apply a bright/bold lip - locking the color into place and making it last much longer. 3. 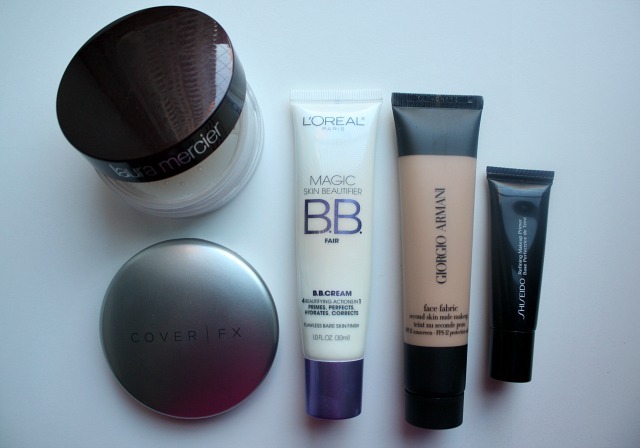 Loreal Magic Skin Beautifier BB Cream in Fair - This was one of the first BB creams I ever bought and have been in love with it ever since. I find that my skin looks smooth and even immediately, and I can wear this BB cream alone or under another foundation. What impressed me the most about this product was the staying power. I can wear it all day, stay incredibly matte and still look well put together late into the evening. Not that my inner 80 year old ever stays out late into the evening, but on that rare occasion, my makeup can keep up. 4. Giorgio Armani Face Fabric in 1 - Velvet skin is the name of the game with this foundation. With a light and airy whipped-like texture, this is the makeup I reach for on days that I need a bit more coverage but still want my skin to breathe. 5. Shiseido Refining Makeup Primer - I want to love makeup primers, I really do. I use them all the time and yet am often underwhelmed. So when I tried a sample size of this Shiseido primer, I geared up for blah and what I got was BAM! It wore beautifully under any foundation I paired with it, and kept my skin matte and oil free longer than any other primer I have used.